Stokke is known for its baby products and has developed high chairs, baby carriers, and nursery furniture that is recognizable by its clean lines and modern flair. 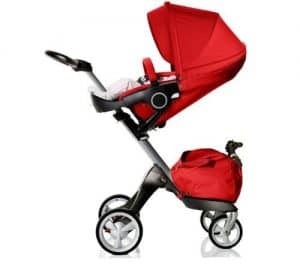 The strollers are some of the best in the business and have been used by countless celebrities. Of course, celebrity-level style and function doesn’t come cheap. Are Stokke stroller and stroller accessories worth the price tag? That’s up for you to decide but one thing is pretty clear: Stokke products bring convenient features and a lot more style than you’ll find with other strollers. Why? Simply because Stokke’s goal is to create designs that are in the best interest of your baby. They make serious efforts to strengthen the bond between parent and child and facilitate child development. 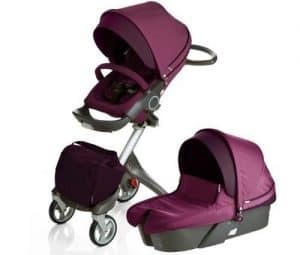 These are not your average strollers and they are much more than their price tag suggests. Let’s take a look at three of our favorite models. 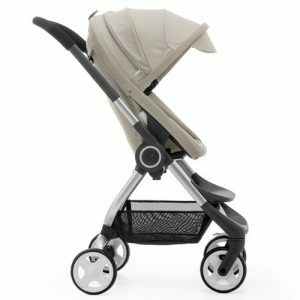 The Stokke Xplory Stroller is one of the most stylish strollers around, but that’s not all that’s great about it. In addition to looking fantastic, it’s also easy to use and has a lot of really cool features that come in really handy when out and about with your little one. First, the details. 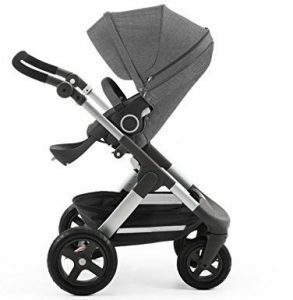 The Stokke Xplory stroller is made of aluminum and automobile-grade polymer so it’s really durable and lightweight. The infant cot accessory can hold newborns up to 20 pounds or approximately six months old. The seat was made for older babies and toddlers up to four years old or 45 pounds. The first thing you’ll notice when you look at the Xplory is how different it looks from a standard stroller. One of the things that parents love is the adjustable seat height. Typical stroller seats are quite low which means two things. One, you’re never really able to look your baby in the eye. And, two, you have to keep bending over to tend to your little one. With the high seat on the Xplory, not only is your baby at the perfect height for easy diaper changes in the infant carry cot but also plenty of eye contact and interaction as they get older. You get a lot of options here, including two front-facing and three rear-facing positions. Because the handlebars are also completely adjustable, this stroller is great for parents of any height. Tall parents will really appreciate this feature a lot. No more awkward bending over to push the baby along or back and shoulder pain at the end of a long walk. One of the benefits of it being so compact is that its maneuverability is stellar. It can make sharp turns and fit through narrow doorways and aisles. Plus, it has shock absorbers so that your baby won’t be bothered by any particularly bumpy roads. The tires are also puncture-proof and easily removable in case you ever need to store it. The underseat storage bag is amazing. It’s really big and comes in really handy for holding baby items or even groceries. There are also plenty of pockets where you can store toys, your smartphone, or your keys. What’s more, if anything gets dirty, clean-up is easy. The bag and all of the fabric on the stroller are easy to remove and machine washable. The Stokke Scoot Stroller is the company’s compact version. It’s slim, smaller, and less expensive than other Stokke models. Like the Xplory, it’s suitable from birth until age four or around 45 pounds. The Scoot has a lot of the features that Stokke is famous for. The aluminum construction is solid and easy to push. Plus, the fabric is removable and machine washable. Most importantly, it has the high seat so you can easily reach your baby and make more eye contact. You can even make the seat forward or rear facing with some pretty simple adjustments. Because this is sort of the stripped down model, the Scoot doesn’t have as many bells and whistles are the others, but that doesn’t mean it’s not an awesome stroller. One of the best things about it is the steering capabilities. It’s really easy to control using only one hand. This model is also really compact when you fold it down. It actually stands on its own when folded and can fit in smaller vehicles. While this isn’t the best stroller for jogging or walking on a trail, it’s perfect for flat surfaces. If you’re looking for something that’s suited for walking around town or running errands, this is a great fit. Plus, it’s the most affordable option. If you want a Stokke that’s more likely to fit you budget, the Scoot is the best option. If you’re looking for a Stokke that will take you off-road, check out the Stokke Trailz Stroller. It has the high seat that the other models have and is made for newborns up to 33 pounds. It’s compact when folded and can easily stow away in the trunk of most cars. That’s not all, there are five seating positions, three rear- and two forward-facing. Even from the basics, you can tell this is a rather awesome product. What makes it really stand out from other Stokke models? It can easily handle a variety of terrain, including grass, gravel, dirt, and paved surfaces. It’s equipped with advanced suspension and had large, air-filled tires. And the best part? Your newborn won’t be disturbed by any excessive bumps or being jostled around. Most strollers that are designed for this sort of activity only have three wheels but the Trailz has four. This gives it a lot of stability by comparison. It’s also really easy to maneuver whether you’re talking rocks on a walking trail or racks of clothes in a department store. The large basket gives you a lot of room for storage. Because the stroller’s seat is so high, there’s a lot of vertical space, too, so you can really stack it up.